Eradication of guinea worm disease (dracunculiaisis), targeted by the World Health Organization (WHO) for the year 2015, is finally within reach, with only 25 reported human transmissions in 2016. Now, researchers writing in PLOS Neglected Tropical Diseases have re-asserted the cost-effectiveness of the global Guinea Worm Eradication Programme (GWEP), some thirty years after it started. 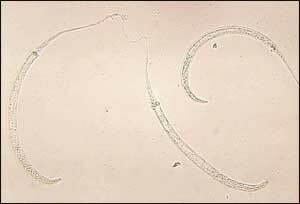 GWD is an infection with the parasite Dracunculus medinensis, spread through contaminated water. In the 1980s, there were more than 3.5 million cases worldwide. Since, GWEP, a collaboration between a number of international and local organizations, has targeted GWD by providing safe sources of drinking water and educating communities about water filtration and other behaviors to minimize disease transmission. In the new work, Christopher Fitzpatrick, of the WHO, and colleagues used existing data on the financial costs of GWEP to model its cost-effectiveness from 1986 through 2030. They compared the current GWEP to either no intervention since 1986, or minimal intervention consisting only of surveillance and outbreak response after 2015. The average cost of GWEP implementation across countries is US$ 0.0176 per capita per year and the average costs of GWEP pre-certification and certification are US$ 0.0041 per capita per year and US$ 0.0015 per capita per year, respectively. From 1986 through 2030, GWEP cost an estimated $11 US (95%CI 4.70-12.49) per case averted, relative to doing nothing. The cost per disability-adjusted life year averted by GWEP was $222 US (95%CI 118-372). The study concluded that GWEP is more cost-effective than both the do nothing and control scenarios, if willingness to pay for one year of life lived without the risk of GWD exceeds US$ 0.10.